Whether you're looking to install a championship course, or just get a little extra practice in the backyard. The Driftsun Typhoon Disc Golf Target will deliver the most accurate off-course putting and driving practice, to help improve your game. Designed with galvanized heavy gauge chains, powder-coated steel frame, basket and chain rack, this target will stand the test of time. It's construction is durable enough to allow for semi-permanent course installation at camps, schools or in the backyard. Weighing in at at total of 40 pounds, the collapsible Driftsun Typhoon Disc Golf Target is easily portable, and can be moved from location to location with minimum effort. The Driftsun Typhoon combines quality and convenience with DGA regulation size to ensure your practice is meaningful and productive. Head to the field for putting practice without heavy lifting or a full-sized vehicle to hold your target. Quick setup and deconstruction make this disc target ideal for fun scrimmages, or some serious solo practice. It's no trouble to set it up for a backyard barbecue or bring it to the field for a game with friends. 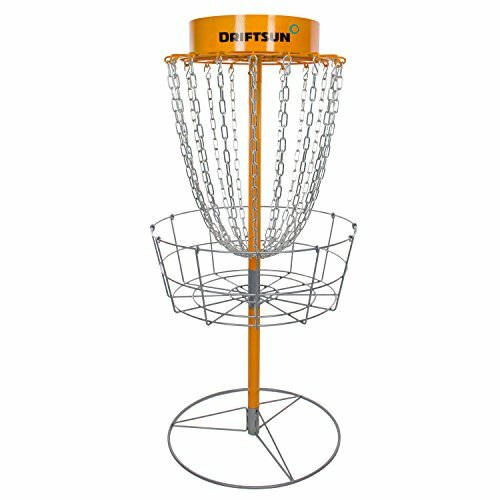 Take your game to the next level with the Driftsun Typhoon Portable Disc Golf Basket. REGULATION SIZE: Excellent practice goal, DGA regulation size to ensure your practice is meaningful, fun and productive. PORTABLE: This target is collapsible and portable, with a standard freestanding metal base and makes for the perfect semi-permanent practice basket in the backyard, schoolyard or park. HEAVY DUTY: Durable construction, this heavy duty galvanized steel disc target is suitable for semi-permanent disc golf course play, backyard or practice play. HIGH QUALITY: All weather resistant galvanized chains and powder coated steel frame can withstand weathering from the harsh conditions. FUN: Perfect and hone your disc golf skills, play with friends, bring the game of disc golf anywhere! If you have any questions about this product by Driftsun, contact us by completing and submitting the form below. If you are looking for a specif part number, please include it with your message.